Hippo Blue ABC Jungle Adventures Giveaway!! I've featured Hippo Blue on the blog before, but in case you aren't familiar with the name, Hippo Blue is a 100% Australian owned company that sells a range of personalised items including bags, stationery, and labels. 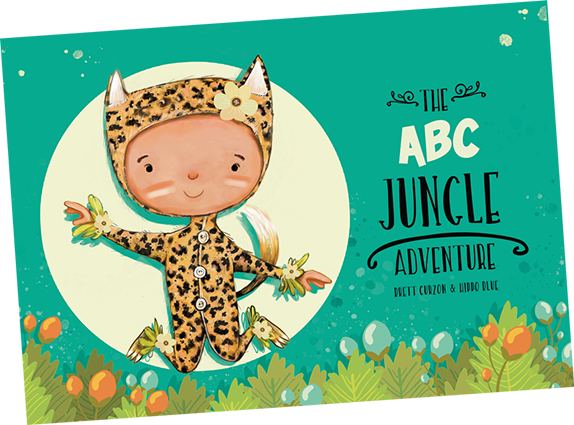 They also have two personalised children's books, 'The Adventures You'll Have', and the recently released 'The ABC Jungle Adventure', as well as activity books, puzzles, and cards. The beautiful story books have been written and illustrated by Brett Curzon. Your child is the main character, and as the story unfolds, he/she is introduced to a range of characters that accompany your child on their adventure. What I love about these books is that they are able to be personalised with family/friends/classmates names for every letter of the alphabet! The story is told in rhyming verse, and the illustrations are vibrant and whimsical. Also, there are added details that will entertain your child for longer; for example, your child can look for a little hidden spider on every page as they are taken on their journey through the jungle. The activity books are ideal when travelling or when you are out and about. 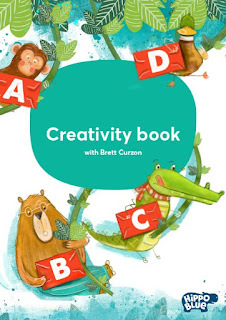 Containing 32 pages of awesome educational activities, including hand-writing practice, as well as a sticker sheet, this book will surely delight and entertain your child! The cards allow your child to learn their ABC's whilst playing a fun match-up game. 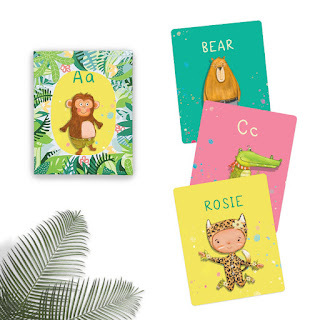 The cards are larger than standard-sized cards, which makes them great for little hands, and they are printed on premium card stock with a plastic coating for added durability. Hippo Blue have kindly offered some products from The ABC Jungle Adventure range to give away to one of my readers, valued at $75!! (you will be able to personalise these items for your child!) plus free postage. What is your (or your child's) favourite jungle animal, and why? 2. Giveaway closes on 24th February, 10 pm; winner will be contacted via email within 48 hours. Failure to receive a response from the winner will mean the prize is forfeited and a new winner will be chosen. 8. The total prize pool value is $75 plus free postage. The winner will be issued with a voucher code to redeem the items through the Hippo Blue website. Disclosure: I was given a voucher code redeemable for the items listed above to give away to one reader. I have not been paid for this review. All opinions are my own and are not influenced in any way. They look really sweet, a lot of fun as well as educational. I wish I was still caring for grandkids..I love this kind of thing!! 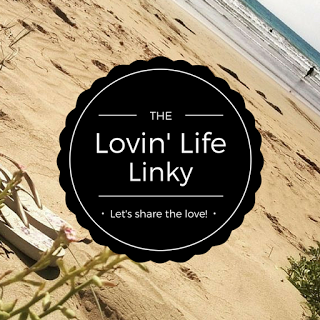 Thanks for linking up for #lifethisweek 7/52. Next Week: A Pet Story. I won't enter as my son's a bit old, but good luck to everyone who enters! There's a Giveaway on my blog's Facebook page if you want to enter! I love leopards because they are solitary souls, and whilst some have spots, there are others that are all black and they are such majestic looking cats. My 18 month old loves monkeys, he always tries to make sounds like them and shouts for bananas constantly, he's a cheeky monkey himself! My email is mala@malakennedy.com :) Thanks for the chance! The elephant is may daughter's fave. Definately Snakes - beautiful creatures and my kids love them so much they begged me to get a reptile licence. Dian Fossey said "when you meet gorillas, you meet individual personalities". Such regal primate animals which share with my family such close physical characteristics. Crocodiles!!! My little guy Logan loves to whisper 'along came the crocodile and SNAP' in the three cheeky monkey song. I even have to draw croc eyes on his hand! Dad days are the best! We have adventures in life and in books. We take on characters and funny voices and love to rhyme and string the words together fast! Some days are like living in the world of Dr Suess. Busses, trains and signs have letters we spell out and anything starting with P for Poppy creates excitement seeing her name. We draw letters in chalk, sand and paint. This age of discovery (4yrs old) is soo much fun for all of us. Oh and she tells me her favorite is the giraffe. As even in the tall jungle when they stand up you can always find them! After years of reading, watching and adoring Disney's The Jungle book, they have developed a love for Baloo, the big old ticklish friendly bear and his happenin' dance moves. We did some research to find out if bears really do live outside the Jungle Book. We're delighted to share that they infact do... Brown jungle bears are native to the jungles of India. My childrens response was "I knew that mum, Bears rule! Lovers of all animals especially jungle bears, I'd love to win my children this amazing Hippo Blue prize pack. They'd have such a blast getting to personalise each item, giving all the animals creative names. Now I've found you I'm following :) Thanks.